The red carpet at the 17th Annual SAG Awards last year didn't just host celebrities. We also were lucky enough to witness a very special wedding proposal. When Giovanni Roselli, a former WWE wrestler, current actor and fitness coach in the New York Metro Area, and proud SAG member, learned he was drawn from the ticket lottery for two seats at the SAG Awards, he knew he had the opportunity of a lifetime. Not only was Roselli excited to attend the SAG Awards, but he knew that it would be the perfect setting to ask Stacey, a fourth grade private school teacher in White Plains, New York, to marry him. "As soon as I got the call that we had the tickets, I immediately thought that the trip out to LA would be a great place to do it. Then I thought, 'Wait a second-- how cool would it be if I did it on the red carpet?' Proposals are meant to be memorable, so I couldn't get an opportunity more memorable than that!" With the busyness of getting ready for the SAG Awards-- making flight arrangements, choosing a gown and suit, etc-- Giovanni knew that Stacey would be distracted. "It is such an experience in itself to be on the red carpet and at an elite awards ceremony. I knew her mind would be distracted by the event itself and I would be able to completely throw her off guard." Giovanni had a plan. Though the concept was there, the details were slightly complicated, as Giovanni had to make the journey from New York to Los Angeles with the ring in tow. "It was a little stressful to get on and off the plane, as the ring needed to go through security. I had to make sure that we were in different security sections. Then I had to go through the security to get onto the red carpet where I had to take it out of my pocket. That got me a little nervous. It was also a little funny overall that I had this big ring box in my tuxedo pocket that I kept shielding from her so that she wouldn't be able to notice." Luckily for Roselli he was successful at keeping his secret safe. Some people are lucky to catch just a glimpse of their proposal on their personal cameras. For Giovanni and Stacey they had a slew of some of the most talented celebrity photographers in the country right at their fingertips. After the press realized what was going on, all eyes were on them. Cameras and fans were there to witness the magical moment as Giovanni got down on one knee to ask Stacey to marry him. Giovanni's hard work certainly paid off-- She said yes. Stacey donned another stunning gown, this time in white, to marry Giovanni. 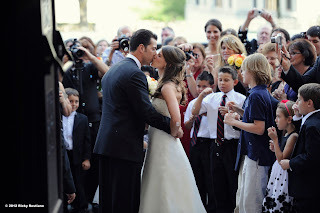 Giovanni and Stacey were married surrounded by family and friends in 2011. The newly-wed Roselli's have been lucky enough to be drawn again this year for the ticket lottery to attend the 18th Annual SAG Awards. Looks like plenty of blue skies and red carpets for these two. A big congratulations to the Roselli's on their fairytale wedding. Thank you for sharing your special moment with all of us at the SAG Awards. We'll see you on Sunday! Proposing on the red carpet? Seems so dreamy to me! I wish I've done the same back when I proposed to my wife. Sadly, the closest I could come up with to that was kneeling on some kids rugs at the Diner where she works. Sigh... If I win the lottery I'd re-propose to her just like that for sure. He was so lovely, how could a woman say "no" at such a beautiful wedding proposal?